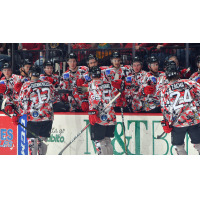 BINGHAMTON, N.Y. - The Binghamton Devils erased a two-goal deficit to hand the Charlotte Checkers their second loss of the season, 4-3, in front of over 4,100 fans at Floyd L. Maines Veterans Memorial Arena on Friday night. Saku Maenalanen put the Checkers up 1-0 on the power play after a deflection in front of the net. Janne Kuokkanen played a pass across the hash marks from the right wall that deflected right to Maenalanen who beat Eddie Lack. The goal was Maenalanen's third of the year with assists from Kuokkanen and Andrew Poturalski just 5:19 into the game. Another power-play goal put the Checkers up by two before the ten minute mark of the first. Julien Gauthier moved down the left wing side and lifted a shot over the right shoulder of Lack for the 2-0 lead. Assists on Gauthier's fifth of the year were credited to Aleksi Saarela and Martin Necas at 7:28. The Devils got on the board late in the first to pull within one. John Quenneville found Marian Studenic below the goal line and he wrapped the puck around Alex Nedeljkovic for his sixth of the year. Studenic's goal came with just 0:27 left in the first period and the Devils trailed by one after one period. Charlotte took another two-goal lead 9:16 into the second period. After a turnover by the Devils in the defensive zone, Maenalanen hooked up with Kuokkanen in the left circle and his shot beat Lack on the blocker side for the 3-1 lead. The goal was Kuokkanen's sixth of the year and second point on the evening. Binghamton answered back after calling a timeout to tie the game for the second time of the night. Michael McLeod went right around the defense after receiving an Eric Gryba pass and beat Nedeljkovic by the left leg pad to pull within one goal. Gryba and Colby Sissons assisted McLeod's third goal of the year at 10:37 of the second frame. Shortly after, Josh Jacobs put home his first of the year from the point to tie the game, 3-3. McLeod fed Jacobs at the right point and his shot sailed through traffic and by the blocker of Nedeljkovic at 13:03 of the second. The game remained tied at three heading into the third period. The game-winning goal came off the stick of Blake Pietila 3:20 into the third. McLeod forced a turnover and fed Pietila in the right wing circle who beat Nedeljkovic over the left shoulder for his third of the year. McLeod and John Ramage collected the helpers and the Devils held on for the 4-3 win. Lack stopped 21 for the win and Nedeljkovic put aside 24 for the loss. The Devils return home tomorrow on Military Appreciation Night presented by Lockheed Martin and Stand With Me. All current or veteran military receive FREE tickets. CLICK HERE. Also, the Devils will wear special military jerseys to be auctioned off after the game to benefit the Southern Tier Honor Flight and Stand With Me.